Bree refuses to believe what Anne just said and accuses her of lying, but Anne defends herself saying that she wouldn't make something like this up. BREE: Yes, you would, because you're a liar. ANNE: I know you've been looking for us. You went to your birth parents' address and found a burnt-down house, right? BREE: How did you know? ANNE: That was our old house. ANNE: You put an ad in the paper asking your birth parents to contact you. But all you got was a letter from my mother telling you to stay away from our family. Am I right? Bree doesn't know what to think now. Loris finds a crying Carmella outside the Scarlet Bar and sits down for a chat. Carmella asks Loris if she's noticed how no matter how hard you try to repress your past it always comes back to haunt you and Loris says she's discovering what that's like now (with the Janelle situation). Bree asks Anne why she didn't tell the truth about her maternity when she first arrived. Why did she pretend to be a fan of Bree's book? Anne says she was waiting for the right time to tell her secret. BREE: How could there ever be a right time? You're trying to destroy my life! ANNE: But it's not your life! It's mine and it was stolen from me! Anne says she reckons Bree knows that she's telling the truth, but Bree asks Janelle for support and to tell Anne that she's lying. Janelle says she needs to speak with Anne in private though and Lou offers to take Bree over to no. 24 for some ice-cream so that the newly reunited mother and daughter can have a chat. 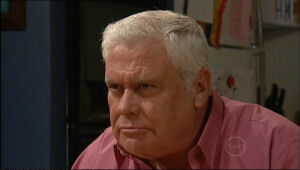 Harold's at one of the tables working on some stuff when Dylan sits down to have a chat with ‘Mr. Bish'. Dyl needs some help with picking a present for Sky, he wants something to show for them entering a new phase in their life getting back together and with the baby on its way and all. Harry not-so-subtly suggests that Dyl gives Sky a ‘band of gold', ie. proposes to her, it's the obvious choice after all. Dylan reckons it's too out there even for Sky though. Just as they talk about which one of them who knows Sky better she appears and wants to know what they are talking about. Dyl makes an excuse about discussing what to order for her. Loris enters the bar with Carmella in tow and orders champagne for the two of them. LORIS: Forget about the juice, I mean, if you're gonna have to repent you may as well do it in style. Harry's glancing over at Loris and Sky asks who she is, but Harry doesn't want to answer. In fact he tries to avoid the question by pretending there is no lady there at all! Sky works out that this lady is Harry's drinking buddy and that he's probably brought her and Dylan over to the bar so that they could meet this lady. Dylan looks over his shoulder to have a proper look at the lady and realises it's his Nan. DYLAN: Forget it Hazza, you'll get no joy from her. Ooh, what's the betting then that in a few weeks time we'll see Loris and Harry getting close, ay? LOL Dylan walks over to the bar to say hi to Loris and she calls him ‘Botty'. I'm not really sure about that nickname. It makes me think of bottles and it's not a pretty picture. Hmm. Bree is talking to Lou about her disastrous family. LOU: Well, if there is such a thing as a model family I've yet to meet one. I mean, look at the people in this street. BREE: It's probably why we fit in so well. Lou tells her that the family she ‘accidentally landed in' is actually the best kind of a family- they love and care for each other and stick together through thick and thin. Bree says that's what worries her because Anne's a Timmins by blood and she's not, she's an outsider. 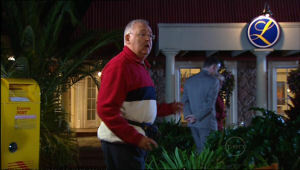 She also thinks she's a horrible person for throwing away Anne's cane, but Lou refutes that and tells her she's wrong. LOU: You have shared too much with this family not to be a big, big part of it. Now whatever happens with Anne you will always be cherished. Especially by your Mum. Bree wonder why Janelle kicked her out of the house then. Lou asks her to put herself in Anne and Janelle's place for a minute. They've just had a big shock and need some time to talk and she needs to give them that time. Janelle and Anne are sat on the sofa for a chat. JANELLE: I won't think the worst of you as long as you're completely and utterly honest. ANNE: Don't you know that I'm being honest now? JANELLE: You've done nothing but fib (sp?) and cause trouble since you arrived on our doorstep. ANNE: I am your real daughter. I'm a Timmins! And you know it in your heart. Janelle starts welling up and hesitantly places one hand on the side of Anne's face and then the other before leaning in to place her forehead against her daughter's. Aww. No music was necessary in this scene, it was much more emotional with it. Sky is excited about Harry's drinking partner being Loris. SKY: My granddad and Dyl's Nan, it's the perfect match! Harry tells her he had no idea who Loris was before tonight, but he'd heard Janelle tell stories about her, stories which made his hair curl! That must have been some stories then as it would take quite a lot for his 1cm long hair to curl up. Apparently Janelle was in such financial strife once that she had to write to her in-laws begging for a loan by using an unopened phone bill to write her message on. She redirected the bill to her in-laws as she could do that for free because she couldn't even afford a stamp! Loris did reply though with an envelope all empty aside from a stamp. So based on stories like this one Harry reckons he'd better not get involved with Loris, she's not really his type. Oh yeah, but somehow Svetty was his type? Hmm, I don't get it. Dylan and Loris are talking about Janelle his appalling mother turning down the offer to stay at no. 26. DYLAN: Did you call her appalling to her face? LORIS: Not this time, I swear! I just thought it. Dyl reckons that his Nan got what she deserved then. Loris wants the other children to be taken into consideration though, isn't Janelle thinking of them at all? Ned arrives saying he tried to talk to Janae but she slammed the door in his face and Dylan wants to know why this is Ned's business. Loris tells him Ned works for her and Dylan wants to know what kind of job he has, but that's not a question that they're going to dignify with an answer apparently. In her usual style, Loris steers the conversation onto another topic when the questions start to get unpleasant and wants to talk about the house issue again. Loris asks Dylan if he thinks Janelle should accept the house and he says he reckons she's crazy if she doesn't. LORIS: I can't tell you how much your support means to me, Botty. DYLAN: I'm not offering support, no more than you ever offered us. Dyl agrees to go have another chat with Janelle about the house to try and make her see sense and Loris excuses herself to Carmella who's been waiting patiently for ages now. On her way out, Loris gives Harry a little wave and a smile and he looks pleased until he remembers that he probably shouldn't be so flirty in public. Hehe. Carmella asks Ned to stay and have a drink with her and he agrees. She tells him she's missed talking to him and he feels the same. Bree and Lou arrive back at the Scummins household and Bree wants Lou to stick around for a bit. Janelle agrees so he gives in even though he really reckons it's a family affair. Janelle tells Anne they need to call her parents and they should also tell them the truth about her maternity. Anne doesn't want to since then they'll ban her from ever coming to visit the Timminses again. Bree's sceptical and thinks Anne is putting on an act, but Janelle tells her to cool it since they don't know Anne's parents and she could be telling the truth about them this time. Anne asks Janelle for a lift home and Janelle offers to talk to the parents about how brave their daughter is, but Anne wont' allow it. ANNE: NO!! It'll be the last you ever see of me! And I can't let that happen! I won't! Carmella and Ned have now moved on from drinking to playing pool/snooker/whatever it's called. The song that's playing in the background is one that Carmella loves so she wants to dance and for Ned to join in. He's a bit sceptical as he thinks it might break some rules. CARMELLA: Do you really expect me to do God's work stuck in a convent 24/7? NED: No, but not on a dance floor either. She's disappointed by his response and goes back to the pool/snooker/whatever it's called table again sulking. Ned thinks this is a great opportunity to say he's sorry about Cam. Great timing, Ned! You have the sensitivity of an ox! It turns out Ned wants to apologise for the way that he behaved when Cam and Carmella were together and he's sorry she's lost a good friend. She tells him he doesn't have to apologise, but he says that it was obvious to everyone how good Cam was for her and she was for him. Oh really? I must have missed that then. Maybe I fell asleep because of the boring scenes they had together or something. Anyways, Carmella starts to feel uncomfortable and Ned realises that he said too much so now he's ruined her night. She says he didn't, but still leaves him behind to get them more drinks. Ned's reluctant and thinks it might be better if she went home, but Carmella's got other ideas. She comes up really close to him and for a second there it seems as if she's about to kiss him, but what do you know, Mother Superior comes in at that very moment! Uh-oh. Janelle returns home after taking Anne home and Bree's eager to know if she got to meet Anne's parents. It turns out she didn't since Anne made Janelle drop her off around the corner from her house. Janelle says that if Anne's so scared of her parents then maybe she's got good reason for it. BREE: So you believe her? I guess I'm not the only one whose life's been blown to bits. Lou makes a comment about Janelle and Bree handling things really well when Dylan comes in with Loris in tow. Janelle wants her mother-in-law out of the house but Dyl asks her to calm down. DYLAN: But for once, use your head. This is a once-in-a-lifetime offer, she won't be making it again. JANELLE: Good. Then maybe she'll rack off and leave us in peace. Dylan reminds his mother that her wage will not be enough to cover all the family's expenses, plus Kim's money may not last forever so buying them the house is the least that Kim's parents can do to make up for things in the past. Janelle's not convinced, but Dylan's persistent and leaves the ladies behind to work things out for themselves, taking Bree with him. Carmella's talking to the Reverend Mother about recent events in her life and her problems of sticking to the rules of her new vocation. She says she becomes more restless the more worthy she becomes in the church, so basically when she gets more involved in church activities she feels the need to break the rules more and more. Hmm, this does not bode well. Mother Superior asks if this might have to do with Cam's death and if that's the only problem at the moment. CARMELLA: Reverend Mother, I've done something wrong. I've done something very wrong. I sold my cousin's baby for $100 000. Carmella's explaining the story of her cousin's baby to the abbess. Apparently the cousin was only 17 and was really scared about her parents finding out about it neither did she want the baby. This was at the same time that Connor was in desperate need for money to fund Maddy's operation so Carmella decided to sell the baby to this couple she'd met. She split the money with her cousin and gave her share of the money to Connor. Instead of turning herself in to the police, Carmella then decided to join the convent and things were fine until the cousin contacted her again wanting her baby back. At that time it was too late to do anything about it of course. Cam overheard that phone call and tried to help and now he's dead… The Reverend Mother suggests Carmella takes some time off to think things through and to correct her mistakes in the past and Carmella begs her to let her stay in the convent. 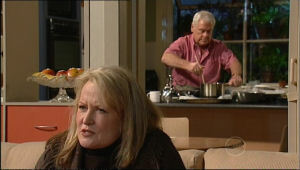 Lou is cooking up a storm in the kitchen while Loris and Janelle are chatting in the lounge. LORIS: I'm giving you the keys to a house. I don't know why you're so hostile. JANELLE: Because you're a lonely, old bag who's frightened of old age. Don't think you can buy us just because you've run out of options. LORIS: This offer has come from the heart. JANELLE: You don't have a heart. LORIS: We've got more in common than you think. JANELLE: I've got nothing in common with you. LORIS: We've both been deserted by a Timmins man. LORIS: My husband of more years than I care to mention has been keeping a mistress, also for more years than I care to mention. JANELLE: Not some little bimbo? LORIS: Far worse. A desiccated old prune, five years my senior. Janelle bursts out laughing and Loris tells her she's been wrong about her. Yes, she is appalling in many ways, but she knows Janelle isn't responsible for her grandchildren living in poverty, Kim is. It turns out Loris reached this conclusion years ago, but she's just been too proud to admit it. Now she wants to give Janelle the house to make up for it. Janelle says she'll consider the offer. They look over to the kitchen where Lou is still busy cooking and Loris notes how Janelle didn't introduce her to him. Janelle tells her it's none of her business and gets a bit riled up when Loris says she's noticed how Lou's stuck around all day. LORIS: Look, my son let you down badly. If you've been lucky enough to find someone who's actually here I say good on you. Carmella shows up at the door and Ned lets her in so they can have a chat. Ned asks if she's okay and she says she's not. Apparently OxNed™ is no more since he realises that this is probably not a good time for them to talk about that ‘moment' they shared at the bar earlier. Ned says he's been in friendships that have crossed the line before and it's been awkward afterwards so he doesn't want that to happen between him and Carmella. She agrees but says she can't talk about that now, instead she needs a friend, especially one with a spare couch. Ned says that's something he can help with. Loris is having a drink by herself when Harold walks past her, bum bag around his waist. Hmm, seems he's swapped those morning walks for evenings walks instead then. They get into a conversation about Tazzle and Harold says he might be able to help her satisfy her need for the red liquid gold that it Tazzle. He just happens to be carrying around two mini bottles of Tazzle in his bum bag, you see. What a coincidence! He gives them to Loris who is so pleased she calls him her saviour. Harry says he's got most of the box of Tazzle he bought from Max the other day left, so if Loris is interested then they could split it between them. Loris says she's willing to pay extra for her share, but Harry won't allow it- it's standard price or nothing! That's a deal then and to celebrate they drink to it by having those mini bottles of Tazzle. 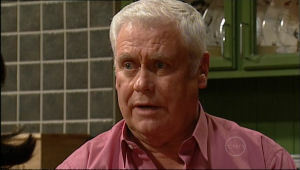 Harold mentions how he lives in the same street as Loris's daughter-in-law and Sky's the partner to her grandson Dylan. Oh Botty, how lovely! HAROLD: I feel as though I know you already. LORIS: Has my reputation preceded me? HAROLD: Yes, yes it has. LORIS: One shouldn't believe everything one hears, one could form the wrong impression. And that might hinder a friendship and that would be a shame, wouldn't it? HAROLD: Yes, yes, it would. LORIS: So I suppose you and I will be seeing much more of each other in the future. HAROLD: Yes, I suppose so. Oh my, such blatant flirting going on! Bree has filled Sky and Dylan in about Anne's big revelation and Dylan says he's going to have to rethink his opinion of Anne then, but that still doesn't mean he has to like her. Bree points out that Anne's his sister. BREE: So you share the same DNA. SKY: Everyone in the whole world shares the same DNA. It's a matter of degrees. BREE: Yeah, but she's closer to you than to me. She's a Timmins. DYLAN: Hey Smidge, she's not going to take your place if that's what you're thinking. Dylan points out how Anne never grew up with them and she doesn't love them like Bree does. Bree's their sister and the fact that they're not related by blood doesn't change anything. Sky excuses herself to go to the loo and Bree takes the opportunity to ask Dylan what's going on with him. He confides in her about his thoughts about proposing to Sky. Bree gets excited and asks about her brother's plans for this proposal. He tells her that he's planned to do it by taking her out to dinner and then he'll pop the question. BREE: Do you want her to say no? Since they're talking about Sky here it needs to be original and Bree tells him it's up to Dylan to think of something. Just then Sky returns and Bree pretends to be crying so that Sky won't know that they've been talking about her. Lou's finally finished cooking so he and Janelle can sit down for a nice quiet dinner together. Turns out he's been cooking his special schnitzel that he used to make down at the pub, the schnitzel that Janelle used to order all the time. Aww. He points out how he even remembered the whole recipe from memory which isn't so bad considering recent events. Janelle says she doesn't buy the idea of him having problems, his memory is as sharp as a tack! Lou says it's being with Janelle that keeps him young. Janelle starts to cry and Lou ensures her that he's just there as a friend, nothing else. JANELLE: That's why I'm crying! LOU: Well, that's no good, I'm trying to cheer you up! JANELLE: It's just been one bombshell after another today and the whole time you've just been here for me… I mean, not getting in my ear with annoying advice, but just being here. LOU: I like to be part of your life. JANELLE: You know, it's weird, but… It feels like you've always been part of it somehow. LOU: It does, doesn't it? Maybe I have found my new calling in life- being your friend. JANELLE: We've grown so close in such a short period of time. I mean, you've got to wonder where it's headed. JANELLE: My whole life I have just wanted a good man who would stick by me and I got the opposite. Perhaps it's time I stopped looking. ‘Cause maybe… I mean, maybe you're the one. Oh dear, I can't handle any more confessions today. There's just one after the other. Good thing this is the end of the episode then- phew!